Pictured left is the start point of my run across the USA. This is Ruby's Cafe in Huntington Beach, California. 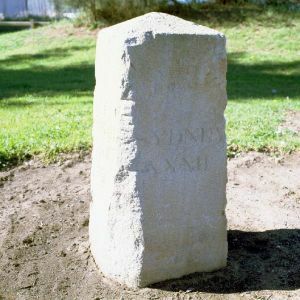 You'll hardly need reminding that a mere 3100 miles lie between this point and the finish line in New York. I really can't tell you how much I'm looking forward to setting off from here at 06:30 am on the 1st May 2011. 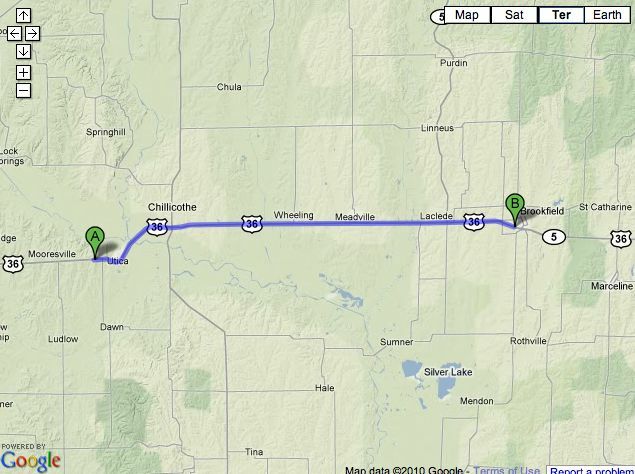 I don't have to wait until then, however, to get the run across the USA started. Well sort of! On August 1st and the 100 days thereafter, 6 teams of Northern Rock IT staff will compete against each other to run or walk 3100 miles. It will be one huge virtual relay across the USA, following the same route that I will be taking. 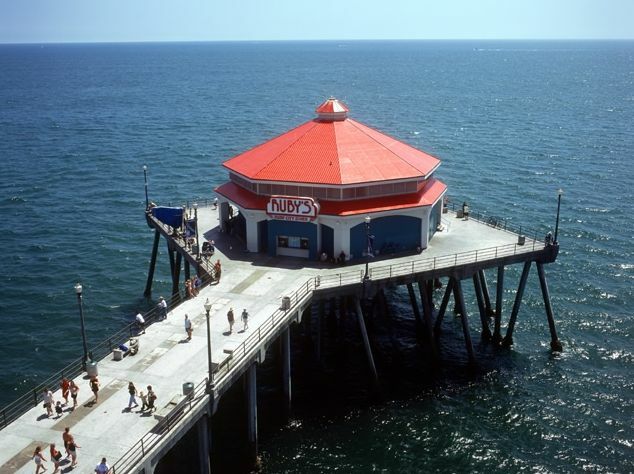 Teams will be kept informed of progress being made on a weekly basis and the first team to (virtually) reach the pier in Coney Island, New York will receive a special prize. The aim of the virtual race across the USA is not only to raise fitness levels in the department but also to raise funds for St Benedict's Hospice and The Children's Foundation. Each entrant has paid an entry fee and each team is being sponsored. I'll update my blog with progress being made in the "Northern Rock Virtual Race Across the USA" from time to time. Watch this space. Fund to receive a boost via t-shirt sales. Digital Spark Ltd have already donated £100 to the two charities as a result of @rungeordierun reaching 1000 followers on Twitter before the end of June. It looks odds on that a further £200 will be donated if I reach 2000 followers by the end of July. 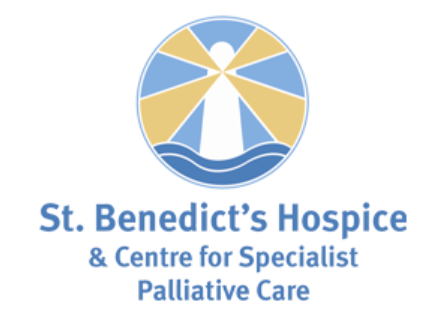 I got some further good news today from Digital Spark Ltd. Much to my extreme gratitude, they are prepared to donate even more money to St Benedict's Hospice and The Children's Foundation. This time their scheme is that for every Run Geordie Run t-shirt bought between now and the end of August, Digital Spark Ltd will donate £5 to the two charities. So you pay £10 (plus postage) and the charities receive a further £5 from Digital SparkLtd. And don't forget that, as per usual, the 2 charities receive every penny of that £10 (which is exactly how we at Run Geordie Run like to do our fundraising). So lets do the maths! For every £10 t-shirt sold, the charities actually receive £15. Unbelievable! T-Shirts (as modelled by myself and Sir Ranulph Fiennes above) are screen printed front and back for durability. The 2 charities logos can be seen on the front and the details of the 3100 mile run across the USA 2011 are on the back. Over 500 t-shirts have been sold already. Stocks are limited so please don't delay in ordering. 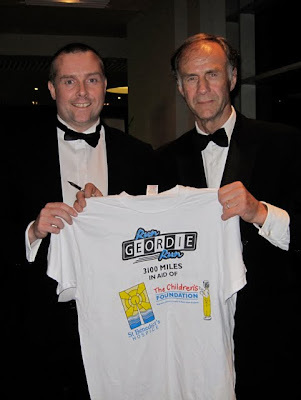 Run Geordie Run t-shirts can be ordered by clicking the big red button button below. 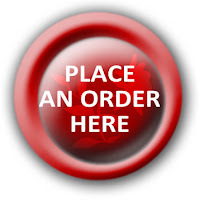 Full instructions on how to pay will appear at the end of the order form. Payment can be made securely using a debit/credit card via justgiving.com or by cheque direct to charity. Either way, the money goes directly to charity. Brilliant! The recovery continues! I haven't had my "Moon Boot" on for 4 days and haven't had to use my crutches for 3 days. That's all well and good but the best sign of my recovery is that the swelling in my ankle and foot is right down. It's been a good week. 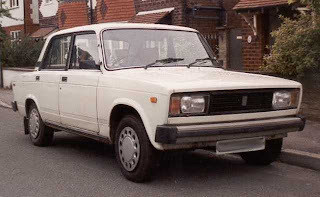 I've managed to cycle 18 miles, walk countless miles around the office and Metrocentre and most important of all, of course, I've been able to drive. The Paddy Power Bionic Ankle is ready to be put to the test even more next week. The plan is to hit the gym before work and do an hour on the bike. At lunchtime, I'll be spending an hour on the cross trainer. After work, I'll be doing an hour of so of swimming. I say "or so" because it depends when Run Geordie Run Junior turns up. We normally end of playing swimming games and throwing inflatables around. It's going to be a tough week but hopefully the first of many like this. My ultimate aim is to make the first run I do as pain free as possible. Whenever that is! October hopefully! I've found it quite fascinating recently, thinking about one of my childhood heroes; Steve Austin, The Six Million Dollar Man. As sad as it sounds, taking my mind back to when I used to wear a red suit similar to the one above and running in slow motion, has really help me come to terms with the accident, the operation and now my recovery. I think it would take a psychologist to fully figure this one out. Not once have I ever regretted falling off my bike and breaking my ankle. I think the childish part of me is thinking it's quite cool to be part "bionic". In fact, scrub that. All of me thinks that it is quite cool to be part "bionic". Imagine, my joy when I found the image above. It appears that, like me, Steve Austin was sponsored by Adidas (look at his trainers!). That's pretty bloody cool actually! 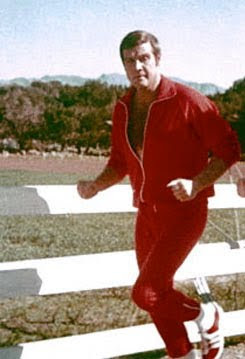 If Lee Majors happens to be reading this and would like to join me for a few miles during my run across the USA in 2011 then I'd be a very happy man indeed. Lee - my email address is sponsorship@rungeordierun.com. I look forward to hearing from you. "Mark Allison, Geordie runner; a man barely able to crawl. Gentlemen, we can rebuild him. We have the technology. We have the capability to build the world's first bionic ankle (sponsored by Paddy Power). Run Geordie Run will have that ankle. We can make him better than he was before. Better, stronger, faster." If wearing a matching pair of flip flops wasn't exciting enough, I'm happy to report that I was able to drive to work for the first time in 2 months today. I had a short trial drive last night with an emergency stop. There was no pain in my ankle so I made the decision there and then to start driving again. I keep saying it, but it's amazing what you take for granted. Being able to drive again gives me my independence back and I'm now able to get to the pool when I want. Thanks to Mrs Run Geordie Run for the many lifts here and there. I suppose apologies are also in order as I'm probably one of the worst back seat drivers ever! For the last 2 weeks, when I haven't been wearing the temporary "Moon Boot" prescribed by the Surgeon, I've been wearing "Sports Slips" by Sole. They were among a parcel of goodies sent to me to try out and I've been waiting to give them a good field test before publishing my thoughts on this blog. My immediate thought was how well they fitted my feet. It was quite a novelty to be able to wear matching footwear after so many weeks of wearing a cast on one leg! Luxury! It's amazing what you take for granted! Once on, I was able to walk around in great comfort using my crutches. The section around the arch and heel were particularly well moulded to my feet. I was previously warned not to wear sandals or flip flops when I had the cast taken off. The Sports Slips, however, showed no sign of slipping off thanks to a perfectly balanced section that stretches over the top of the foot. More recently, I've been able to walk around without the aid of crutches and put them to a full test. Still very comfortable! One of the recommended uses of the Sports Slips is "post-run recovery". I can see these being of great benefit when I start running the big miles again and indeed when I run across the USA next year. Once I've tried the custom insole and performance socks that I was also sent I'll post an additional review. I'm waiting for the swelling on my right foot to die down before buying a new pair of work shoes for the insoles. In the meantime, the Sole Sports Slips get a big thumbs up from Run Geordie Run. If I had found something to criticise, I would have done. So I'm more than happy to recommend them. They also do a women's version and lots of colour combinations. Thanks go to Sole for sending me some of their products to try out. 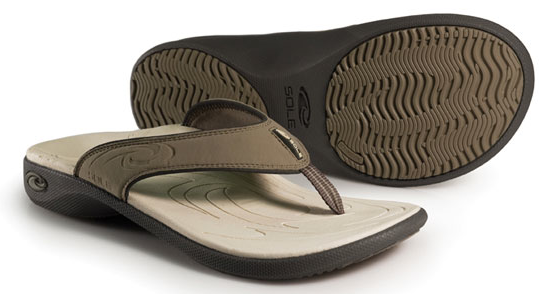 Further product information is available on Sole's website here. Another month and another fundraising milestone. This time, it gives me great pleasure to report that the fund for St Benedict's Hospice and The Children's Foundation has burst through the £12,000 barrier and currently sits at £12,140. For my US followers that's 18,560USD. It's a very impressive figure in Japanese Yen with a grand total of 1,606,397JPY. Whichever way you look at it, thanks to the generosity of so many kind folk, I have reached almost 1/4 of the fundraising target. That remarkable generosity is something I never take for granted, by the way. And I really mean that. There are so many people doing so many wonderful things for charity. I'm very humbled by the fact that people are choosing to contribute to the 2 charities I'm raising funds for. I noticed this week that justgiving.com have setup a page where you can see all money raised via them to date. The overall justgiving.com total is £53,225.41. Prior to using justgiving.com I raised £14,765 for other events since 1994. That gives a grand total raised to date of £67,990.41. When I set out to repay the debt of gratitude to St Benedict's Hospice in 1995, I didn't even imagine that it would reach anything like that figure. Not bad, for putting one foot in front of the other a few million times! For the record, here is my justgiving page. What was quite literally a daydream 4 weeks ago, became a reality this weekend with the Run Geordie Run comic strip appearing in a major local publication. Local illustrator Gary Hogg has worked extremely hard and I was so pleased to see the final product in The Journal newspaper yesterday. 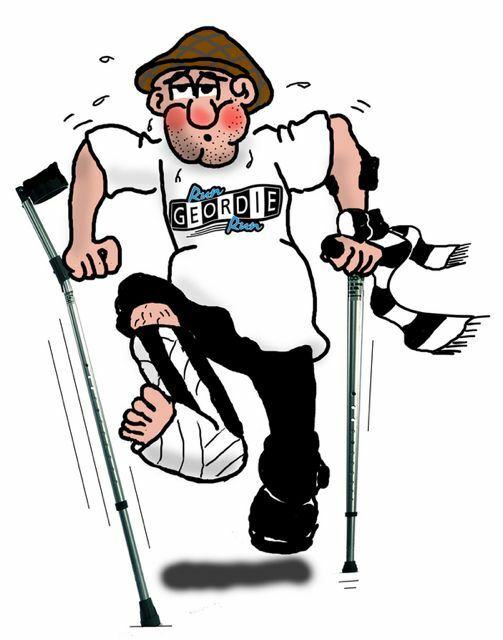 The comic strip entitled "The Fairly Truthful Story of Run Geordie Run" will feature in The Journal every Monday over the coming few months. It is designed to inform, entertain and raise the profile of Run Geordie Run. The comic strip is s a parody of Forest Gump with a huge dollop of stereotypical Geordie humour thrown in for good measure. I'll be continuing to work with Gary on new storylines and gags and they will, from time to time, mirror what is happening in the real life world of Run Geordie Run. For example, I can exclusively reveal that our intrepid cartoon hero is about to have an unfortunate cycling accident in an up and coming episode. Oh and watch out for "Porsanal Trainer - Dave Recknon". Any similarity to real life Personal Trainer David Fairlamb may be co-incidental! The Journal article with a link to the comic strip can be viewed here. Gary's website, which is well worth a visit, can be viewed here. Thanks to Gary Hoog for his efforts so far. Thanks also to The Journal for their column inches and continued support. I said goodbye to the Grant Edwards Run Geordie Run Plaster Cast two weeks ago in Newcastle General Hospital. Since then I've been wearing a "moon boot" now and again and have been able to walk short distances without the aid of crutches. As soon as Mr Fearon (the surgeon who operated on me) was happy with the new x-rays, I set about looking for a sponsor for my "Bionic Ankle". This was done by an auction via Twitter. I'm pleased to report that bookmaker Paddy Power had the winning bid and my right ankle (metal pins and all) is now to be known as THE PADDY POWER BIONIC ANKLE. 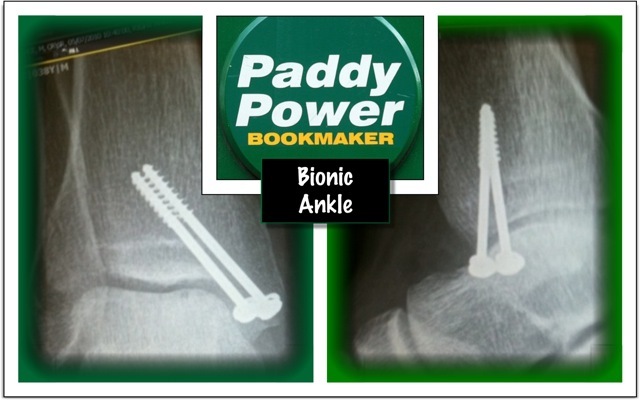 News of the Paddy Power Bionic Ankle sponsorship deal was reported in The Journal yesterday. It almost goes without saying that the funds received from Paddy Power are in aid of St Benedict's Hospice and The Children's Foundation. Thanks to Paddy Power for their support. Now to work on getting the Paddy Power Bionic Ankle back to full fitness.